The Lynas controversy has now dragged on for quite a few years. Fed up with BN’s lack of concern, many voters in Gebeng, where the Australian-owned plant is located, switched their support to Pakatan Harapan (PH) in the hope that PH would heed their concerns about the potential dangers the plant poses both to their health and the environment. Now it appears that the PH government is having second thoughts about shutting down the plant with ministers sending mixed signals about the government’s intentions. Entrepreneur Development Minister Redzuan Yusof caused a stir last week when he opined that the Lynas factory would not be shut down after all as the government needed to send “a signal that foreign direct investment was welcomed in the country.” He also drew attention to the strategic value of the plant and its role in breaking China’s near monopoly of rare earth material (used in everything from televisions to nuclear reactors) besides stressing the importance of maintaining good relations with Australia. Promises and principles often mean little to politicians but to suddenly hear a cabinet minister behaving like a spokesman for Lynas, echoing all their talking points and, in the process, undermining his own cabinet colleague in charge of the environment is surely a new low. 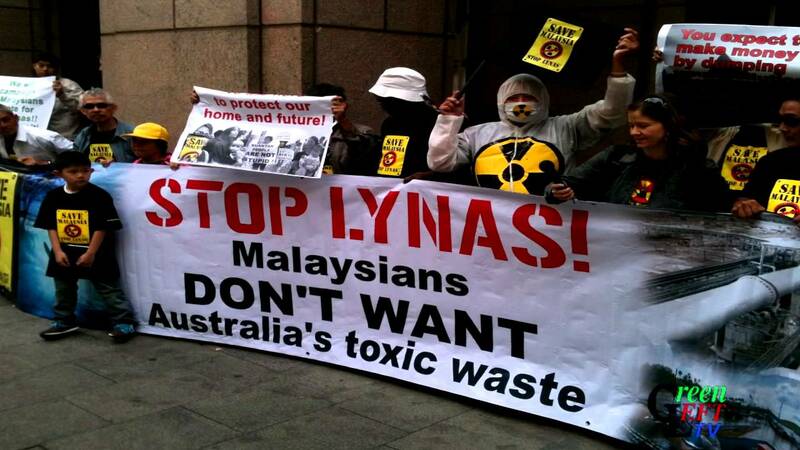 From what we know, Lynas has already accumulated over a million tonnes of scheduled waste and over 450,000 tonnes of radioactive waste within its premises. Waste containing heavy metals including thorium is highly toxic and is known to cause cancer, leukaemia and birth defects. It also has a long-term negative impact on the environment. Astonishingly, there does not seem to be a clear and acceptable plan to deal with this growing accumulation of highly toxic waste other than to store it on site in violation of the 1974 Environmental Quality Act. Yeo Bee Yin, the environment minister, rightly insists that Lynas must export the waste back to Australia as a precondition for the renewal of its licence. Others in cabinet, however, are apparently willing to accept its storage in Malaysia in the hope that an acceptable waste management plan can eventually be worked out. While some might think it’s acceptable for Lynas to store or dump (depending on how you look at it) millions of tons of toxic waste in Malaysia in order to serve the strategic interests of other nations, it is Malaysians who will ultimately suffer the consequences. Indeed, recent evidence that the ground water in the vicinity of the Lynas plant is already being contaminated by heavy metals ought to give serious concern to the authorities. We might well be witnessing the makings of another potentially devastating Bukit Merah-type environmental disaster. Bukit Merah, the site of an earlier Japanese-owned rare earth plant, is now one of Asia’s largest radioactive waste clean-up sites where thorium contamination has resulted in an increase in leukaemia, birth defects and other ailments. Of course, Lynas insists that their facilities are safe and low-risk but if that’s the case why go to all the trouble of exporting their partially processed oxides to Malaysia for further processing? And why the continuing reluctance to send back to Australia the waste from its Gebeng operations? Is it because the Australian government knows that it’s too toxic to safely store and is, therefore, depending on good old Malaysia to come to the rescue? What price is the PH government willing to pay in order to send the “right signal” to investors? Does foreign investment and good bilateral relations with Australia trump the health and well-being of Malaysians? In recent weeks, we have become increasingly aware of the dangers that environmental pollution poses to our nation. Reports that unscrupulous operators have illegally imported tons and tons of plastic and industrial waste, dumped toxic industrial effluents into rivers and lakes, and failed to safely store or dispose of toxic waste have resulted in growing disquiet. The recent Sungei Kim Kim incident, arising out of the illegal dumping of chemical waste, also demonstrates how vulnerable we have become to industrial pollution. It also suggests that the Department of Environment (DOE) and other agencies are simply not up to the task of meeting the kind environmental challenges we now face. The fact is we have all been too lackadaisical about environmental concerns and must now demand that the government do more to protect our environment and safeguard our well-being from toxic waste and pollution. And until we get our act together, until we put in place a credible regulatory framework with strong enforcement mechanisms, companies like Lynas should never be allowed to operate here. Politicians like Redzuan might be here today and gone tomorrow, but the toxic waste that companies like Lynas leave behind might well haunt Malaysians for decades to come. Cabinet must now err on the side of caution and insist that Lynas immediately remove all its toxic waste from Malaysia in addition to meeting stringent new conditions to ensure that their operations here pose absolutely zero risks to the public. Anything less would be a betrayal of the trust that Malaysians have invested in this government.